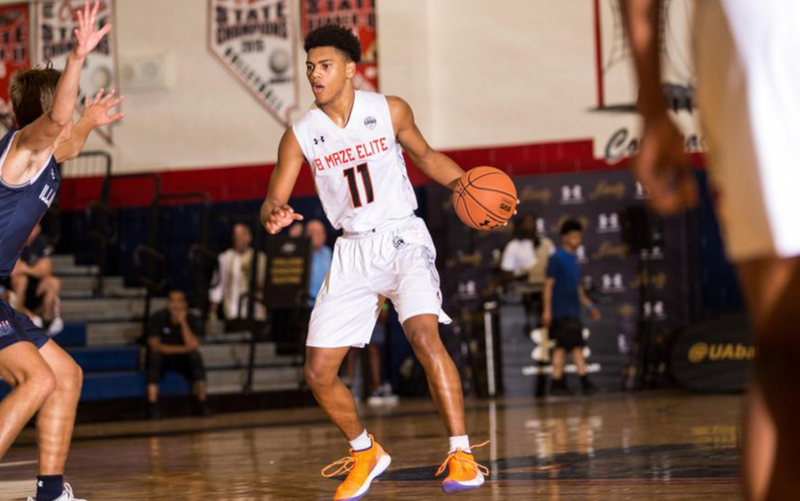 Tennessee recently landed a commitment from a five-star guard in their 2019 class when Josiah James gave the Vols his pledge in their current recruiting cycle. But the Vols aren’t content with just one five-star guard over the next couple years; they’re heavily pursuing another five-star guard in the 2020 class too. Jaden Springer is a five-star shooting guard who plays for IMG Academy in Florida. He transferred to IMG Academy recently and previously played for Rocky River High School in North Carolina. Tennessee and Springer have been in contact for quite a while now, and he and UT’s coaches have developed a strong relationship. And according to Jake Weingarten of Stock Risers, Tennessee used Wednesday to go visit Springer. Auburn also sent in coaches to see the talented shooting guard. Tennessee is in today for 2020 five-star Jaden Springer, Auburn as well, source told Stockrisers. Tennessee’s coaching staff have made Springer a big priority in their 2020 class and visited him multiple times over the summer to watch him in summer leagues. He unofficially visited the Vols back in January of this year, and Tennessee officially extended an offer to him back in September of last year. According to the 247Sports Composite rankings, Springer is the No. 15 overall player in the 2020 class and the No. 5 shooting guard in the class. He’s a consensus five-star who also has offers from North Carolina, Kansas, UCLA, NC State, Auburn, Clemson, and many others. He played for the BMaze Elite team over the summer, the summer league team that’s headed up by former Vol Bobby Maze. When watching his film, it’s evident why Springer is viewed so highly by scouts and college basketball programs nationwide. He’s very athletic and has some incredible ball-handling skills. He can pull up and shoot anywhere on the court, but he really thrives driving to the basket and using his great leaping ability to attack the rim. He’s also pretty good at passing the ball and has the skill to make some pinpoint accurate passes in difficult situations. As a sophomore last year, Springer averaged 24.7 points, 10.2 rebounds, 2.5 assists, 2.4 steals, and 2.4 blocks per game while shooting 61.3 percent from the floor and 34.8 percent from three according to MaxPreps. The Vols are targeting several highly-rated players in the 2020 recruiting cycle, and several of those players are also guards like Springer. But Springer is one of UT’s top targets in the cycle along with high four-star guard Keon Johnson. Tennessee currently doesn’t have a player committed to them in their 2020 class.